The meetings still have a focus on radiosurgery and stereotactic body radiotherapy, but there is now so much more on the integration with immunotherapy and on new techniques like FLASH and GRID. 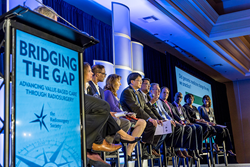 The Radiosurgery Society (RSS), a non-profit medical society dedicated to advancing the science and clinical practice of radiosurgery, announced today the successful completion of its annual scientific meeting, “Bridging the Gap: Advancing Value-Based Care Through Radiosurgery,” held March 20-23, 2019 at the Sheraton Hotel & Marina in San Diego. This year’s meeting featured more than 115 clinical and medical physics presentations on the latest research on stereotactic radiosurgery (SRS), stereotactic body radiotherapy (SBRT), and multi-modality therapies to treat cancer, benign lesions and functional diseases. The meeting included leading experts in radiation oncology, immunotherapy, neurosurgery, medical physics, and medical oncology from around the world. The meeting opened with keynote speaker, Brian D. Kavanagh, M.D., from the Department of Radiation Oncology at the University of Colorado and President of the American Society for Radiation Oncology (ASTRO), who discussed value-based medicine in the current healthcare economic environment. Dr. Kavanagh was also instrumental in moderating the interactive session “Building Collaborative Teams around SRS/SBRT – Exchanging Experiences & Addressing Challenges” featuring radiation oncology and neurosurgery experts from Stanford University, University of Pittsburgh Medical Center, Montefiore Medical Center, Geisinger Health System, NewYork-Presbyterian Hospital/Weill Cornell Medical Center, Zucker School of Medicine at Hofstra/Northwell, and University of Washington. For the third consecutive year, the RSS and the Society of Immunotherapy for Cancer (SITC) co-hosted an educational session that focused on the latest research involving immunotherapy and radiosurgery to treat cancer patients, co-Chaired by Mansoor M. Ahmed, PhD, Program Director, Radiotherapy Development Branch, National Cancer Institute/National Institutes of Health, Rockville, MD and Marka Crittenden, Department of Radiation Oncology, Earle A. Chiles Research Institute, Providence Cancer Center, Portland, OR. New this year was a dedicated session on recent developments in SRS for functional diseases, including presentations from leading neurosurgeons on the advancements of SRS for treating obsessive compulsive disorders, Parkinson’s disease, epilepsy and trigeminal neuralgia. The meeting also included the highly anticipated “Lung SABR/SBRT: Current Challenges and Future Directions” session, co-chaired by Drew Moghanaki, M.D., from Atlanta Veterans Affairs Health Care System and Emory University in Atlanta and Ben J. Slotman, M.D., Ph.D., from Amsterdam University Medical Centers in The Netherlands. This didactic and hands-on workshop featured lessons learned from the VALOR clinical trial, guidelines for evaluating post-SBRT thoracic imaging, SBRT for small cell lung cancer and pulmonary metastases. “Over the years, I have attended many annual meetings of the Radiosurgery Society. The meetings still have a focus on radiosurgery and stereotactic body radiotherapy, but there is now so much more on the integration with immunotherapy and on new techniques like FLASH and GRID. It’s a meeting to hear and discuss the latest developments in the field and easily interact on a personal basis with leaders in the field,” said Dr. Slotman. In addition to the clinical presentations, oral abstract presentations dedicated to medical physics were discussed, including the role of artificial intelligence in radiation oncology and SRS/SBRT, quality assurance for MR-guided radiosurgery, benefits of Monte Carlo dose calculation, and quality assurance methods and procedures for radiosurgery. The RSS 2019 Scientific Meeting is endorsed by the American Society of Clinical Oncology (ASCO), American Association of Medical Physicists (AAPM) and the European Society for Radiotherapy and Oncology (ESTRO). AAPM does not endorse the product in question; rather, it endorses the educational component of the program. ASCO® and American Society of Clinical Oncology® are registered trademarks of the American Society of Clinical Oncology, Inc. Used with permission. This is not an ASCO sponsored event. The Radiosurgery Society (RSS) – a non-profit, independent, multi-disciplinary organization of surgeons, radiation oncologists, physicists, and allied professionals, who are dedicated to advancing the science and clinical practice of radiosurgery. Originally formed in 2002 and becoming (501c6) in 2008, the Radiosurgery Society today (http://www.therss.org) represents approximately 600 members who perform stereotactic body radiotherapy and radiosurgery in hospitals and freestanding centers throughout the world.